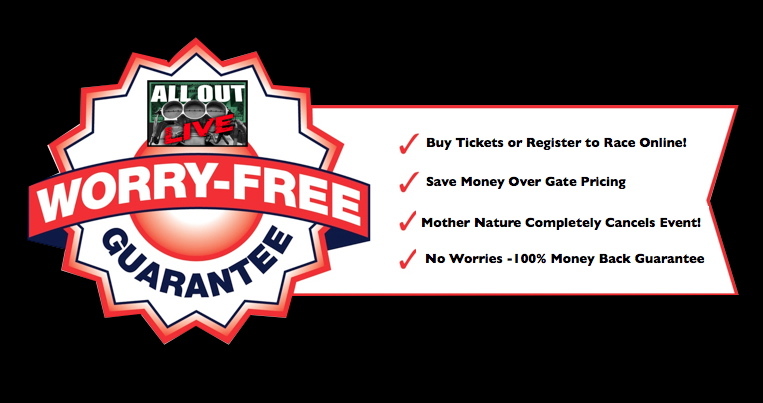 The Worlds Largest Drag Racing Game Show --Tickets — The Worlds First Live Drag Racing Game Show! RACER ENTRIES ARE LIMITED…. SIGN UP NOW! Racer Registration Opens for each event separately. Watch our Social Media and Events Schedule Section of this site for dates and times! With three ET classes everyone has a chance to win cash and prizes! Racers can sign up for multiple events. Your online racer registration holds your racer entry for an event. Once completed, your tickets will be available for download. Don't wait racer registration spots are LIMITED! Sign up as soon as the racer registration for your event opens, got to ur schedule page for dates and times. You must bring your printed tickets and merchandise receipts to the track. Your racer ticket includes one vehicle and one racer entry. Racers get an exclusive online available only ALL OUT Live racer T-shirts during checkout. To increase you winnings check out our Contingency Program page. These selected contingency products along with racer T shirts can be picked up at our Merchandise Trailer at events only. (sorry no shipping). Every ALL OUT Live is a “Worry Free” event. If the event is canceled completely due to weather or other unforeseen issues, you will be refunded within 30 days or have the choice to use the entry to another race! Click on link below that takes you to the FOAT Ticketing site. You will see events and time left to purchase tickets. Choose the event you want to enter. You will see the event and time left to purchase tickets. Scroll down and pick your ET class or type of ticket you would like to purchase. Next to corresponding ET class or Ticket type is a quantity drop down. Choose how may tickets you want to purchase. The next page allows you to buy contingency products and an online only exclusive racer T shirt. Choose and item or click the green continue bottom. The next page is shopping cart confirmation box, make sure everything you want to purchase is correct, then hit green continue button. The next page is the payment page. When complete make sure you print your receipt out to pick up your items and to gain entry into the track. Racer entry includes car & one driver.